After landing in Keflavik after a six hour flight, being shuttled to a rental car office in the middle of nowhere and driving an hour to Reykjavik, Michael and I were wiped out. The mountainous views from Route 41 were absolutely beautiful, but I could barely keep my eyes open. We parked on the street and ran inside our hotel to see if we could check into our room early. It was 7am, so our hopes weren't high. Fortunately, the hotel obliged (for an extra fifty krona, but it was well worth it). Before taking a nap, we wandered downstairs to the breakfast room and were amazed at the spread before us. Instead of sausage, eggs and pancakes, we were greeted with rye toast, cold cuts, cucumbers, tomatoes, creamy skyr and fresh croissants. The delicious smell of coffee and tea filled our noses while plates and silverware clattered on the buffet table. After eating a light meal, we went to sleep. Four hours later, groggy and jet-lagged but excited to explore, we decided to visit Hallgrimskirkja, the largest church in Iceland. Our hotel was easily within walking distance, so we bundled up and made our way down the street. 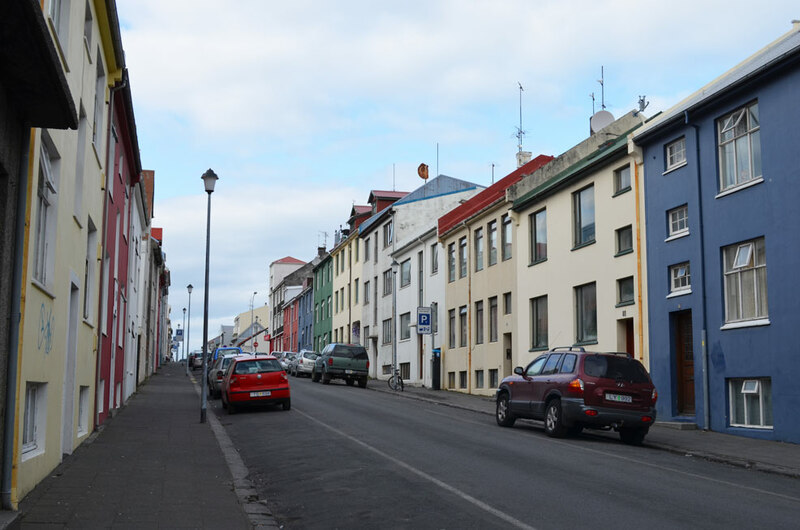 Colorful homes lined the empty sidewalks on Reykjavik. Blues, reds, and soft yellows brightened up the dreary sky. We actually had our best weather on the first day. The sun occasionally peeked through the clouds, giving us a delicious taste of Icelandic sunshine. I was charmed by the vibrant, pastel buildings, which is something you don't see often in America. 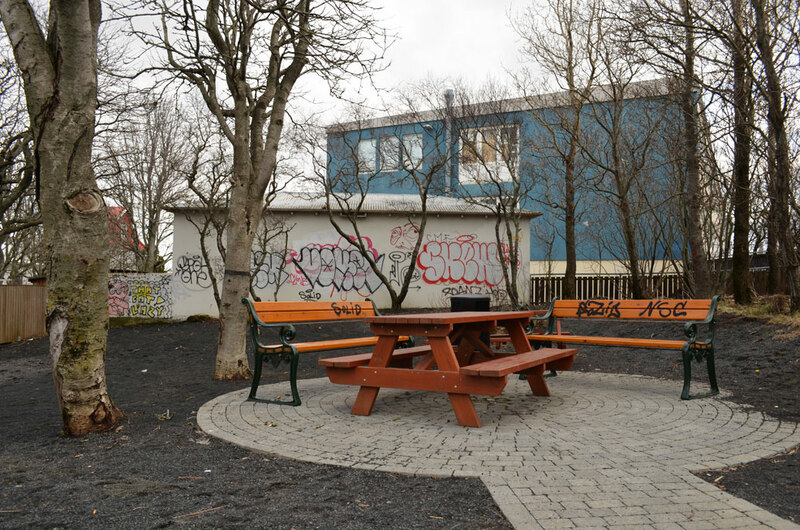 Since Iceland stays so chilly and gray throughout the year, it only makes sense to incorporate vivid splashes of color in everyday life. That was one of my favorite things about the country. We saw Hallgrimskirkja looming overhead several minutes before we reached the square. 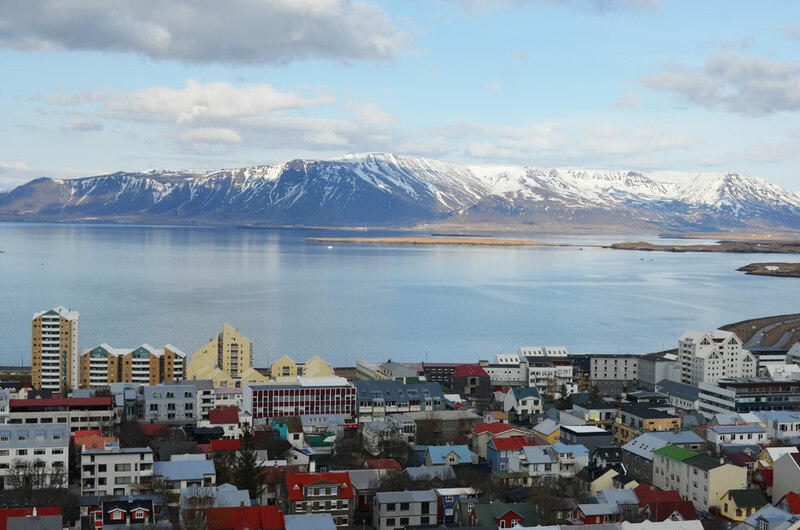 Known as one of Reykjavik's most popular landmarks, the Lutheran church was stunning. The tower's construction was designed by Guðjón Samuel in 1937. His work was inspired by the captivating shapes of cooled lava; according to many, he wanted Hallgrimskirkja's exterior to resemble the basalt lava flows of Iceland's landscape. We captured a few photos before heading inside and purchasing a ticket for the 8th floor observation deck. The view from the top was breathtaking. Snow-capped mountains stood regally in the distance. The kaleidoscopic houses created a rainbow of color that lined the window frames. We could see for miles past Reykjavik, into the great expanse of the rugged countryside. We spent time at each window, admiring the different city skylines and the beautiful mountains. Hallgrimskirkja is an essential pit-stop if you're visiting Reykjavik. Since Michael and I rented a car and drove around the Southern Coast of Iceland for most of our trip, we only had one full day in the country's capital. Our main priority that day was to see Hallgrimskirkja Visiting the church before experiencing the city from a closer standpoint was a perfect way to see the capital from a unique (and strikingly beautiful) perspective.